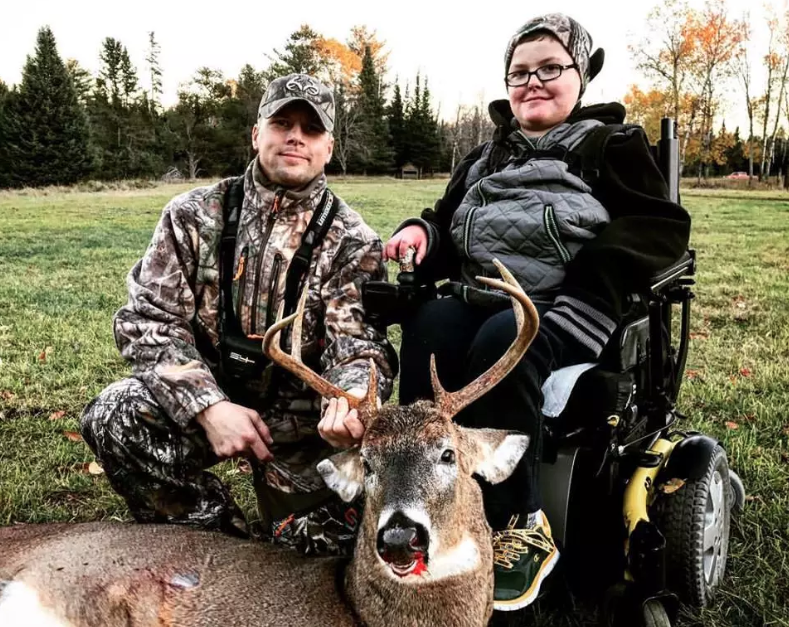 In early November of 2016, at Cedar Hollow Lodge in Grayling, MI, Hunter found himself in a blind. He was joined by his Dad and his guide, Ryan Gati—another incredible man who loves to help kids. Using a gun with the ability to place crosshairs on the target by viewing a screen, Hunter’s limited abilities suddenly disappeared. He was incredibly accurate and made a humane shot on a Whitetail deer, just like any other sportsman. On the second day of his hunt, Hunter harvested a magnificent dream come true—an 8-point buck. He was able to provide meat for his family for a year. Hunter has a new-found love for the outdoors, and similar to all sportsmen, he wants to pursue those dreams. Hunter had openly expressed his desire to hunt a black bear, so we made arrangements with my friend Joe Paul, a DNR Conservation Warden with the State of Wisconsin. Warden Paul is also the Co-founder of Oconto River Kids, (ORK) an incredible group of people whose passion is helping kids with critical illnesses to achieve their dreams through hands-on outdoor adventures. Annually, The Wisconsin Wildlife Federation (WWF) partners with ORK to choose one hunter to receive the WWF state Learn-to-Bear-Hunt tag for use in a WIDNR-sponsored program. Hunter was chosen as the recipient of the WWF bear tag in 2017. Warden Paul hosts a Learn-to-Bear-Hunt program annually in Price County, WI, and Hunter was excited to be chosen to participate in it. Ryan Gati made the trip across Lake Michigan, bringing with him a specialized firearm system to help with this hunt, and once again, we found ourselves in a blind. This time, we were in northern Wisconsin. We had prepared for this weekend of hunting for months on end, and we were having the time of our lives. 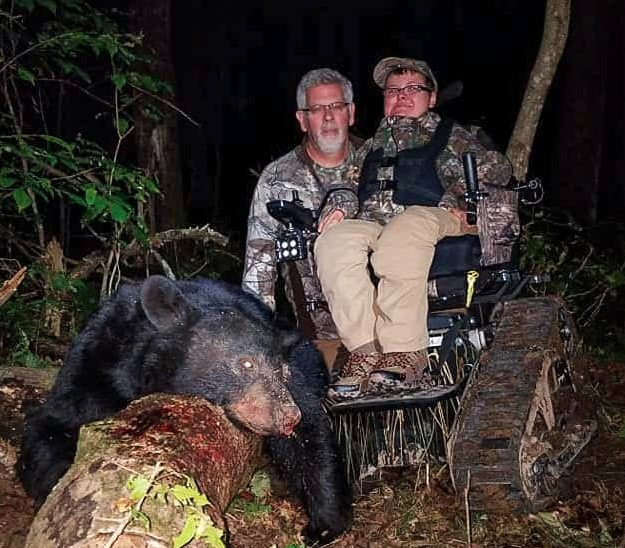 Getting to where we were going to hunt was quite complicated, and it took all three of us grown men to push Hunter’s heavy wheelchair through the rugged paths to the blind. On the very first night, in the last hour of daylight, a nice-sized bear walked in and started tearing up the bait pile. There are no words to describe the excitement we all felt! We came close to getting the shot we wanted, but unfortunately, it didn’t happen that night. Every time the bear was in the right position, we couldn’t get the red dot on him quick enough because he wouldn’t stop moving. Several days went by without the bears coming in close enough for the shot. A few times, we saw the bears circling the bait area, but they wouldn’t enter. Eventually, another bear did show up, but again it wouldn’t quit moving and we couldn’t get the gun lined up for a shot before the bear got spooked and walked off. The whole time, Hunter’s jokes kept us men on our toes—and with plenty of candy bars and donuts available, Hunter said to me, “Ray, if you get out of line, you know I will tell your wife what you’ve been snacking on!” That made all of us laugh! The most enjoyable moments of this hunt were just spending quality time together, telling stories and jokes, and pulling pranks. That next year flew by, and in the spring of 2018 Warden Paul learned that a hunter who drew a bear tag for a 2018 season wanted to donate his tag to Hunter! The hunt was on! We found ourselves in northern Wisconsin heading toward the blind. Once again, Joe, Ryan, Dan, and I were going to be a part of Hunter’s bear hunt. This time, our equipment was a bit different. Hunter had a new Trackchair which allowed him incredible maneuverability, and Ryan had brought along the new gun—The Guardian. Brian Park, the founder of the Ray Park Foundation, had designed this astoundingly accurate and quiet gun. You could watch everything on the screen without even touching the gun. In fact, ORK was so impressed that they purchased the Guardian so that it will be available to more kids who require this specialized system. During the first two days we saw bears again, but they didn’t come into our comfortable shooting range. On the third day, we were all in the blind having so much fun that Joe said, with a big grin on his face, “Maybe we should try to be a little quieter,” but he was instigating just as much trouble as we were. Here we were again, the last hour of that day’s hunt. All of a sudden, Ryan exclaimed, “There’s a bear!” As we looked, we saw a huge bear about 100 yards out, walking towards the bait area. You can’t imagine how hard our hearts were pounding and how loud Hunter’s breathing was—the anticipation of the bear coming within range was indescribable. The closer the bear got, the more excited we got, and Joe once again told us to try again to quiet down… but this time, he wasn’t smiling—he was focused and serious. The bear lumbered in cautiously and turned broadside at about 20 yards next to the bait. Joe gave us the “Ok”, Hunter touched off the trigger mechanism, and the bullet hit its mark. A perfect shot! The bear ran off about 50 yards and expired. For that first minute in the blind, it was dead silent—but just like a bunch of little kids, the hooting, yahoos, high fives and big smiles came out in total exhilaration at what had just happened. What an awesome experience! Hunter made a unique bear claw necklace for each of us for a gift. Whenever I look at it or feel it hanging around my neck, it’s a reminder to me how God can orchestrate an opportunity like this—to involve a group of organizations that are focused on Him, all in order to help others achieve their dreams. On Hunter’s “bucket list” are turkeys, antelope, and moose. We will see what God has planned.